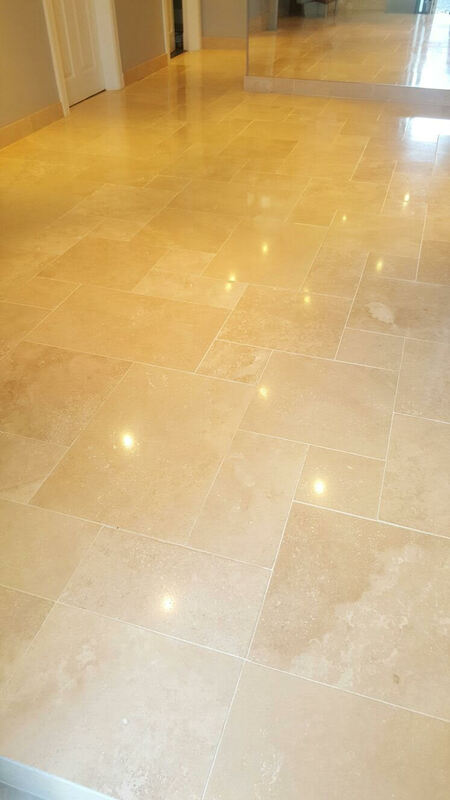 When we arrived at this property in Ayrshire, Edinburgh, it appeared as though the owner’s Travertine tiled floor was in relatively decent condition. On closer inspection, however, we could see that the grout lines were quite dirty and, while there was still a visible shine to the surface, it had become cloudy, likely due to a lack of sufficient maintenance. This was a big concern for the owner, and so they contacted me to see what I could do to remedy the situation. After agreeing with the customer to undertake the work, I travelled to the property in Ayrshire, a county located in the South West of Scotland, on the shores of the Firth of Clyde. 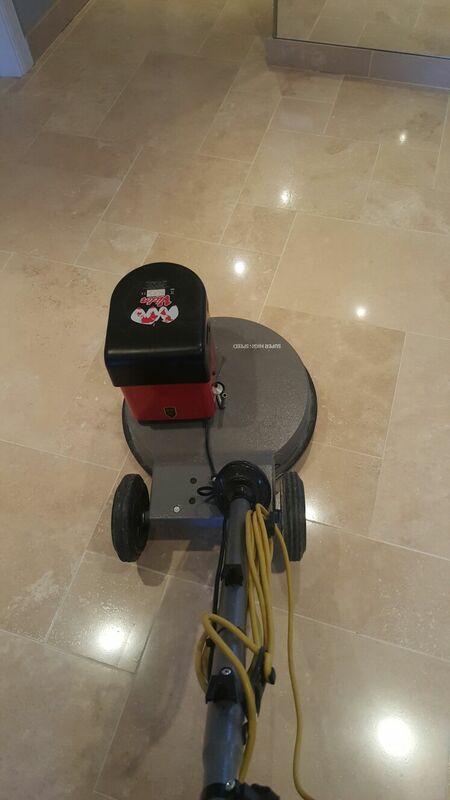 Upon arrival, I set about using a set of large diamond encrusted burnishing pads fitted to a rotary machine to strip the tiles of old surface sealer, break down the layers of dirt, and restore the polished shine. The Tile Doctor burnishing system comprises four main pads of varying grit: I began by applying the Coarse grit pad, before moving on to Medium, Fine and Extra Fine to gradually achieve the desired level of polish. After burnishing the main surface of the floor, I used smaller, 6-inch pads to pay particular attention to the edges and corners. Then, to complete the cleaning process, I scrubbed a strong solution of Tile Doctor Pro Clean into the grout limes to remove ingrained dirt and stains. I also noticed some holes in the grout as well as some completely missing, and also promptly replaced these with new grout. The floor was then left overnight in order to allow it to time to dry completely. In the morning I returned to the house and opted to give the floor a final polish with the extra fine burnishing pad before sealing. 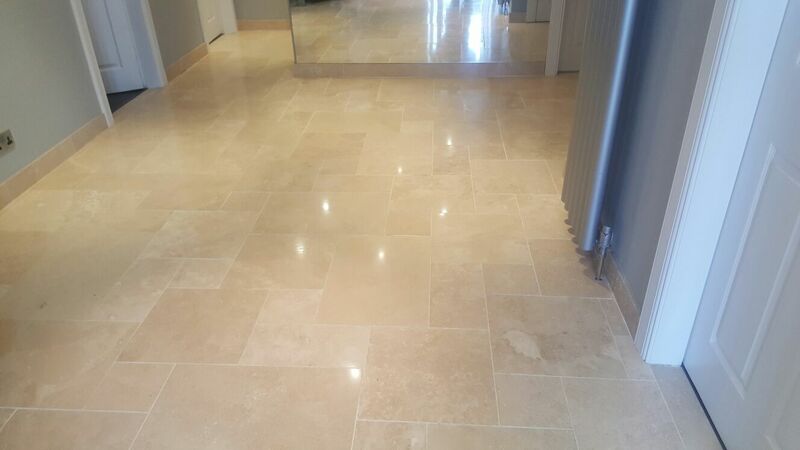 My choice of sealer was Tile Doctor Colour Grow, which was applied in two separate coats to protect the floor against wear and tear, while also accentuating the natural shades in the stone thanks to the sealer’s colour intensifying formula. 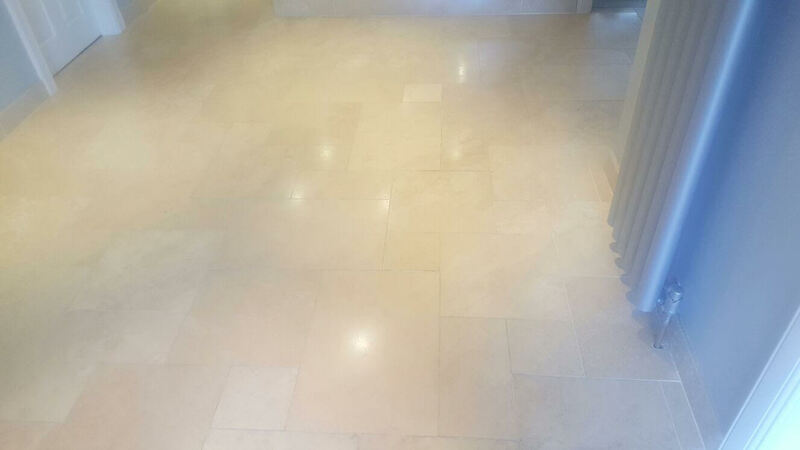 I’m pleased to say that my customer’s worries about this Travertine tiled floor have now been put to rest. The results were very pleasing for both myself and the customer, and I made sure to offer some general tile maintenance advice before being on my way. Another happy customer.